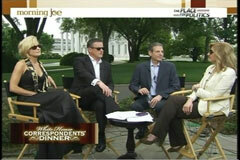 The hosts and guests of a special Sunday edition of Morning Joe fawned over Barack Obama's May 1 performance at the White House Correspondence Dinner. Time managing editor Richard Stengel appeared and knocked host Jay Leno by comparison: "I think that's one of the things that undermined Jay's routine is that it's like coming after the Beatles on the Ed Sullivan Show." Stengel highlighted an off-putting moment from the 2009 dinner when the President joked to the assembled journalists: "Most of you covered me; all of you voted for me." He described this as a "sour note" and admitted, "And there was kind of an awkward laughter because no one wants to reckon with that. I mean, we're in an adversarial relationship, but a respectful relationship." Scarborough also hyped Obama's performance, praising, "The President so easily outperformed Jay Leno, it wasn't even close. It was like Secretariat against my 17-year-old dog..."
The Morning Joe host seemed to have a different interpretation than that of the Washington Post. Scarborough extolled, "And he actually started...with something that works, self-deprecation from a guy who gets knocked around by people in this room as being arrogant, aloof." Except for a mild joke pegged to his falling approval ratings, Obama mostly spared Obama during his 14-minute stand-up routine. JOE SCARBOROUGH: The President, listen, can we just- I know it's an NBC-owned entity, this MSNBC thing we talk about, but can we just say it? The President so easily outperformed Jay Leno, it wasn't even close. It was like Secretariat against my 17-year-old dog, Willie. SCARBOROUGH: I'm telling you, he was very good. And he actually started, I thought, Jon, with something that works, self-deprecation from a guy who gets knocked around by people in this room as being arrogant, aloof. And he just went right after, talking about his ratings, everything else. I really thought that was one of the funnier performances I've seen a president perform. RICHARD STENGEL: I'm not a historian of the White House Correspondents' Dinner, although I've been here way too many times, I don't think the President has ever preceded the comedic act before. MIKA BRZEZINSKI: That was a shame. STENGEL: I think that was the first time that ever happened and it was a very smart thing to do. Remember, he came after Wanda Sykes last year. And, again, you don't want to be after the President. I think that's one of the things that undermined Jay's routine is that it's like coming after the Beatles on the Ed Sullivan Show. JOE SCARBOROUGH: And you're the juggler after, yeah, the Beatles. And of course what a funny joke last night, the president talking about why he wanted to be before Jay because if you're after the time slot, it's always very dangerous. SCARBOROUGH: You brought up a great point off camera about the President being self-deprecating. I thought, again, for a guy who is playing against type who is always accused of being aloof and smug by people in the room, he did something different this year than he did last year. STENGEL: Yes. Yes. Because, remember last year- and it hit a little bit of a sour note in the room- where he said, "You know, I know you all loved me. I know you all voted for me." And there was kind of an awkward laughter because no one wants to reckon with that. I mean, we're in an adversarial relationship, but a respectful relationship. This year I thought he was much more self-deprecating. He talked about the highs and lows constantly. I mean, he would sometimes make fun of the lows and sometimes make fun of the highs. I mean, he was a little penitent. He'd been- It's like he had his comeuppance.